Her Annual Business Leadership Conference: Dare To Be D.I.N.O! Marketing doesn’t have to be expensive. It needs to be effective. With over 30 years in practical development and implementation of a variety of marketing, advertising and promotions, Debbra Sweet leads her company and team at Sweet Marketing Solutions to create effective marketing for their clients. Her personal background and entrepreneurial experience leads a staff of top rated experts to create plans, campaigns and content that converts prospects into clients. Together, creativity flows and your ideas become real. Sweet has distinguished herself through innovation of a proprietary system for assessment and development of business and marketing plans, specialty niche marketing programs, sales, marketing and business development courses, specialty marketing classes and hands on training programs. The specialty workshops, signature programs and training workshops you see below, helps attendees walk out with real world, practical, effective insights and actions to help increase their marketing results. Want to deliver quality, results oriented marketing information to your attendees? Contact Debbra Sweet today to discuss your event content needs on this subject matter. Debbra Sweet is an exceptional marketing mastermind and leader. She never ceases to amaze me with her endless energy to help others find ways to strengthen their business–through her company and the marketing products she developed based on her own first hand experience in building successful businesses. If you want a marketing pro who is a high energy, top thinker who wants you to succeed, you need to reach out Debbra Sweet. She is marketing person that has been highly effective and successful in growing companies and helping business owners to create relationships resulting in top line revenue for their business. I highly recommend Debbra Sweet because of her passion, drive, determination, and diligence. She gets behind the projects she takes on and sees them all the way through completion. She carries herself with great integrity and takes an immense amount of pride in her work. As a person who has worked with her on a few projects it’s truly a blessing to be able to work with an individual who is on the ball and is proactively working to complete the tasks at hand. She is an outstanding marketing expert because she leads by example and has the unique ability to change the mindset of a large group of people. 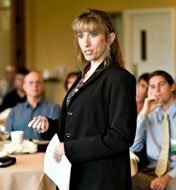 Her breath of knowledge and her ability to apply it successfully makes her an assest to any business owner looking to increase their success. Debbra Sweet is a highly competent professional who I am honored to recommend. She has always responded immediately to any needs I had while growing my business. Her honest management style is refreshing because she is both diplomatic and yet firm when she needs to be. For some of her marketing support, I had her come to our company for on site training of the marketing tools and programs she helped develop. When she came for site visits she not only dressed in an extremely professional manner, but also gave both highly informative and entertaining presentations to my company and staff. Not only are her presentations knowledgeable and easy to listen to, but she also gave the entire presentations, some longer than 20 minutes, entirely from memory. Her business ethics and practices are at the highest levels that I’ve seen, and I’m happy to recommend her for both leadership and marketing roles in any undertaking. This past year has been an exciting one for me. As part of my business growth plans I searched out support from a marketing consultant. I found the one I needed with Debbra Sweet. Working with her, she has motivated us to reach goals we may otherwise have considered “unreasonable.” I find her to be extremely approachable, clear in her thinking and communication and one of the most sincere, honest leaders and marketing professionals I’ve known. She is a true leader. Competition in business is a cold reality… so how do you win the marketing war? The best way is to focus your efforts with a great niche marketing strategy. In this seminar, your instructor, Debbra Sweet, will “pull back the curtain” revealing to you the secret insider information that the pros and big corporations use to make billions of dollars every year. Learn how to create the barrel that all the fish are in so you can fish from your barrel anytime you want.You will be astounded at just how easy and inexpensive this process really is! Debbra will show you the steps you must take to define and reach your best target market on a limited budget. Do you get overwhelmed at the possibility of options to market your business online? Did you know the right kind of website (in flow, structure, design and content) can help you use the internet like a fisherman’s net full of fish to increase your bottom line. Join us and discover why your web site needs to be a vital part of marketing your business. We will be uncovering the Top 3 Web Site Mistakes that are preventing business owners like you from getting new customers… and how you can avoid these profit killing mistakes like the plague! Is your site attracting clients or making them run away scared? Relationship marketing refers to a long-term and mutually beneficial arrangement wherein both the buyer and seller focus on value enhancement with the goal of providing a more satisfying exchange and experience. Customer relationships are key to your marketing strategy. Relationship marketing is not about having a “buddy-buddy” relationship with your customers. Customers do not want that. Customer retention plans demystified: Discover easy to use, highly profitable customer retention techniques and tools that will not only help you retain your current clients but also generate new ones too!